The Centre is pleased and proud to announce that Chairman Andrew Birkitt has achieved a community volunteer award. The Gainsborough Life magazine supported National volunteer week by asking for nominations to recognise inspirational and hard-working volunteers across Gainsborough’s community. Andrew Birkitt awarded Gainsborough’s favourite volunteer has witnessed the Heritage Centre’s growth throughout its years and worked hard as exhibitions officer, and our present Chairman to create a successful and welcoming Centre. He is always on hand with his passion and knowledge of Marshall Son’s and Co and Roses to give fantastic tours of our ground floor industrial exhibits. 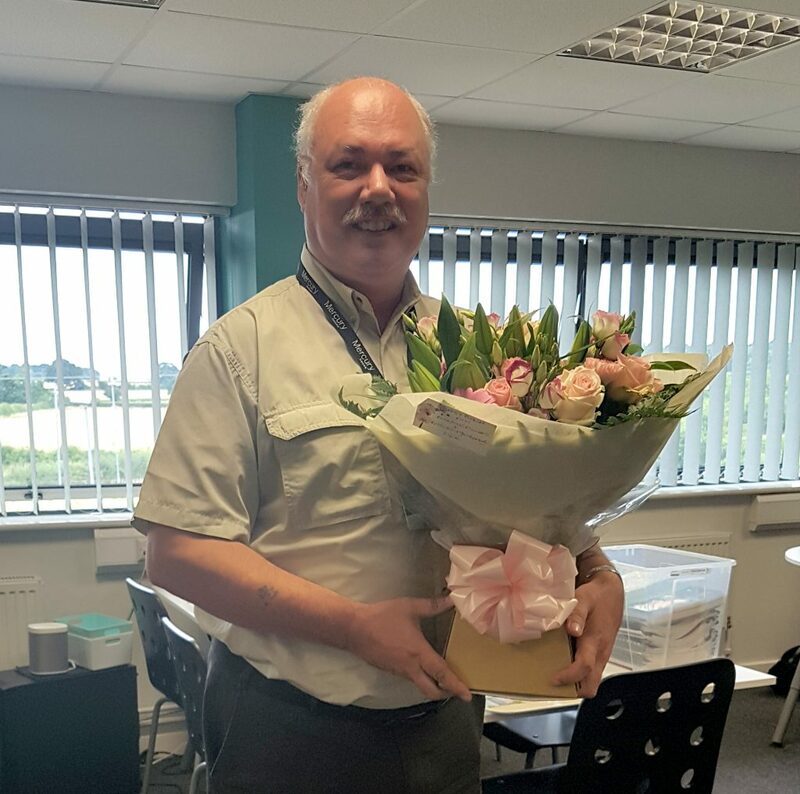 Chairman Andrew Birkitt pictured below receiving a bouquet of flowers donated by Fabulous Flowers (on behalf of Gainsborough Life). Gainsborough Life director and editor Leanne Lodge said: ‘Gainsborough Life wanted to recognise the fantastic volunteers we have in our area and so we asked our readers to nominate a deserving local volunteer to receive a bouquet donated by Fabulous Flowers. Click here to read the Gainsborough Life’s article on the volunteer award, pages 54 – 55. As far back as 1993, Andrew Birkitt teamed up with another local history enthusiast called Paul Kemp and formed the Gainsborough Heritage Society. They were approached by David Lomas and John Stanley of the Gainsborough Museums Forum to hold an exhibition in order to gain public support for the beginnings of a museum within the town. Their exhibition held at Richmond House featured photographs and memorabilia that told the story of the town and visits from local school groups highlighted the need for a museum in the town. Almost 1,000 people visited over the first days that this exhibition was open to the public and it was recorded that ‘at one point on the Sunday visitors were queuing from the House to the gates of the park and the doors had to be closed until some of those milling around the exhibition had left.’ The exhibition being so popular was opened the following weekend to allow the public another opportunity to visit. The Gainsborough Heritage Centre now based at the Old Post Office building on the corner of Spital Terrace and North Street is the lasting legacy from the beginnings of the two young men who launched their exhibition in 1993. Next year, the Association celebrates its twenty-fifth birthday and the team will mark the anniversary with a series of special events. If you would like to join our group of volunteers and help the team to continue to develop the Heritage Centre then please visit the volunteer page here. Alternatively, drop into the Centre or call 01427 610526 or email [email protected] for more information to join in the fun!